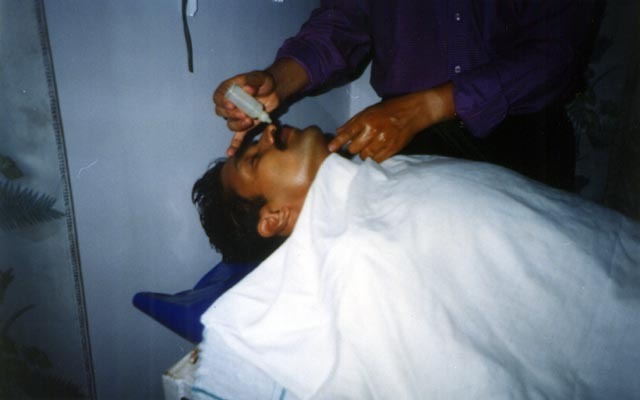 Administration of the medicament through nostrils is known as Nasya karma. According to Ayurveda the nose is the gateway of the head. So, systematically performed Nasya karma cures almost all the diseases of the head easily. It cleanses and opens the channels of the head and improves the oxygenation (prana) which has a direct and highly beneficial influence on brain functioning. Nasya therapy begins with a relaxing foot massage. Warm medicinal herbal oils are applied to the face and neck. Specific care is given to the cheekbones, temples and nasal cavity, helping to release impurities and alleviate pressure. A deep steam inhalation is followed by a warm moist towel over the sinus areas. A few drops of medicinal Nasya oil are slowly dropped into each nostril. The sinus areas are massaged once more with the warm herbal oils. A brief massage of the head, ears and neck follows. This is followed by herbal gargle and mouth wash soothes and clears the throat.